The Locust Horde Falls on Terrinoth To the east of Terrinoth extend the arid Dark Lands. In ancient times, the terrifying Uthuk Y'llan dumped these corrupt desolations into a horde so vast and hungry that the peoples of Terrinoth found themselves at the gates of annihilation. Vanquished narrowly, the Uthuk disappeared into the limbo of history before joining the legends. Till today. Uthuk warriors are a mixture of abominations that can terrify the bravest defenders. In the center of their lines run the Berserkers, malformed and primitive warriors following only the law of the knife. On their flanks fled the packs of Flayers, voracious beasts with live tendons and sharp bones. Spiked Whipers grind their opponents with their claws and under their incredible mass. All are under the command of hateful leaders like Ravos the Eternal-Hungry, whose forces advance to shave the civilization of Terrinoth. 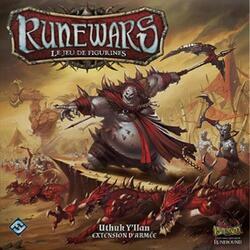 This Army Expansion introduces the Uthuk Y'llan into Runewars: the Miniature Game. It features three units, a special character, and many upgrades, all of which allow you to start building a terrifying Uthuk company (a Runewars Ordnance Kit: the Miniature Game is required for new players).